Why Is Washington Reducing the Deficit Instead of Creating Jobs? Exploring the tension between political support for deficit reduction versus job creation and economic security policies. Most available research indicates a significant difference in priorities between the majority of Americans and the affluent that comprise the political donor class, which may explain the current bi-partisan drive for deficit reduction at the expense of stimulus policies, in spite of persistent high unemployment. 1. Does Washington really care about job creation? Despite near-record levels of unemployment and meager economic growth, the U.S. political system has focused far more on deficit reduction over the past two years than on job creation. Austerity dominates the current political debate even as the economy struggles to recover from the Great Recession. Bowing to political pressures, President Obama created a national fiscal commission in early 2010 to recommend ways to tame the national debt, and discussion about deficit reduction has dominated Washington since then. While a number of factors may explain this hierarchy of priorities in Washington, one point is clear: The focus on deficit reduction over jobs has reflected the concerns of affluent Americans and financial interests while downplaying an urgent desire by a majority of Americans to address job creation. 2. Would further deficit reduction help the economy? 3. 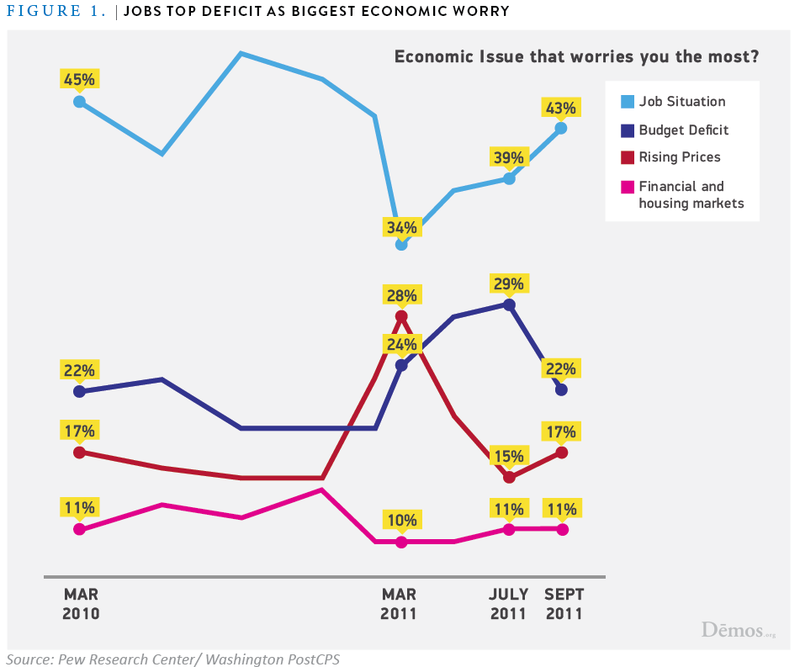 Do voters really favor deficit reduction over job creation? Public preference for job creation is not a recent trend. Polls over the past two years have repeatedly found that while many Americans are worried about deficits and the national debt, addressing unemployment and improving the economy has consistently been a bigger priority for the public. For example, a June 2010 NBC News/Wall Street Journal Poll found that 33 percent of Americans named job creation and economic growth as their top priority; 15 percent named “deficit and government spending.” A FOX News/Opinion Dynamics Poll that same month found a similar spread, with 32 percent naming jobs as a top priority compared to only 12 percent that named the deficit. 4. Okay, but what do the donors want? One third (32%) of all the open-ended responses mentioned budget deficits or excessive government spending, far more than mentioned any other issue. At various points in our interviews, respondents spontaneously commented on “government over-spending.” Unmistakably, deficits are a major concern for most of our respondents. Nearly as many of our respondents (84% and 79%, respectively) called unemployment and education “very important” problems. However, each of these problems was mentioned as the most important by only 11%, making them a distant second to budget deficits among the concerns of wealthy Americans. Reducing the budget deficit is seen as so important to the affluent that a strong majority of them are willing to pay more taxes in order to reduce the federal deficit (65 percent) or cut domestic programs like Medicare, education, and highways (58 percent) for deficit reduction. In contrast, only 34 percent of the general public are willing to pay more taxes and only 27 percent favor spending cuts for deficit reduction. 5. What do large corporations and executives want? Wall Street interests also heavily advocate for debt reduction. The “Fix the Debt” campaign has raised $60 million and recruited 80 corporate CEOs to lobby for a deficit reduction plan that would lower corporate taxes and place the cost burden of deficit reduction on lower income and elderly populations.21 Combined, the 95 companies that make up Fix the Debt have spent almost $1 billion on lobbying and campaign contributions over the past four years.22 In fact, 22 of the companies have spent more on lobbying than they have paid in taxes in the past three years. If the Fix the Debt plan is adopted, 63 of the companies represented would gain as much as $134 billion in tax windfalls by being allowed to repatriate funds without paying taxes. To pay for this windfall, deep spending cuts would be made to safety net programs such as Medicare. On an individual level, the CEOs backing the plan received a combined total of $41 million in savings last year due to Bush-era tax cuts. 6. Do the wealthy even care about job creation policies? One reason that the affluent may be less concerned about job creation is that they have generally been less affected by high unemployment rates and the economic downturn than other groups. Unemployment rates vary greatly based on educational attainment, which also corresponds to affluence. The unemployment rate for those with less than a high school diploma was 12.2 percent in November 2012.23 The unemployment rate in November 2012 for those with a bachelor’s degree or higher, however, is 3.8 percent – a rate which is considered virtually full employment by most economists. More generally, upper income Americans were less negatively affected by the Great Recession and have recovered more quickly. Most striking, given the high importance that the wealthy attribute to the problem of unemployment, is their overwhelming rejection of federal government action to help with jobs. Only 19% of the wealthy say that the government in Washington ought to “see to it” that everyone who wants to work can find a job [presumably a private job]; 81% oppose this. A bare 8% say the federal government should provide jobs [presumably public jobs] for everyone able and willing to work who cannot find a job in private employment. Fully 91% disagree. The influence of money in our political system goes beyond the money spent on elections. Money also influences the policymaking process, as evidenced by how well the interests and priorities of the affluent class are represented in Congressional action—even when they run counter to the wishes of most Americans. Removing the outsized influence of the affluent in policymaking is necessary not only for the democratic process but to ensure that our economic recovery continues. 9. See supra note 5.